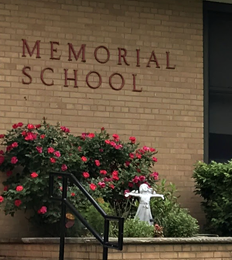 Welcome to Memorial! Our students are the pulse of this learning community, and as educators and community members, we work together to create an environment that promotes the desire to learn and succeed. Beginning in kindergarten, we identify students in need of support, pinpoint the specific challenges they face, and provide targeted intervention to help every student succeed. I will treat everyone with courtesy and respect. I will treat personal and school property with respect. I will create and maintain a positive and safe environment. I will come to school prepared for learning. I will act responsibly and accept the consequences for my decisions and actions. I will help everyone at Memorial School feel capable, connected, and valued. Here at Memorial School, we respect each other. We will help each other to respect everyone and not to tease or leave people out. The way they act, how they look or how they talk. What they eat, their clothes, what they believe, or their families. Open communication between home and school is vital for your child’s educational growth and success. As a school, one of our goals is to make that communication easy. We provide a variety of communication vehicles to do just that. One is this website. Our calendar and news pages will keep you up to date on all our upcoming events and activities. Another is our PTA’s Facebook page. We also publish a monthly events calendar and send paper copies home with your children at the first of every month. Many of our teachers also send home class newsletters. Occasionally, classroom parents will contact you regarding special classroom events or school closings. To ensure you get these messages, please update your contact information regularly. You are also welcome to contact us anytime with questions or concerns. If you need to speak with one of our teachers, you can either contact him or her directly via email or leave a message with our front office staff. We look forward to hearing from you! Our Honeywell Instant Alert system helps you stay informed during school closings and delays. Make sure you are getting the message on the Honeywell website.